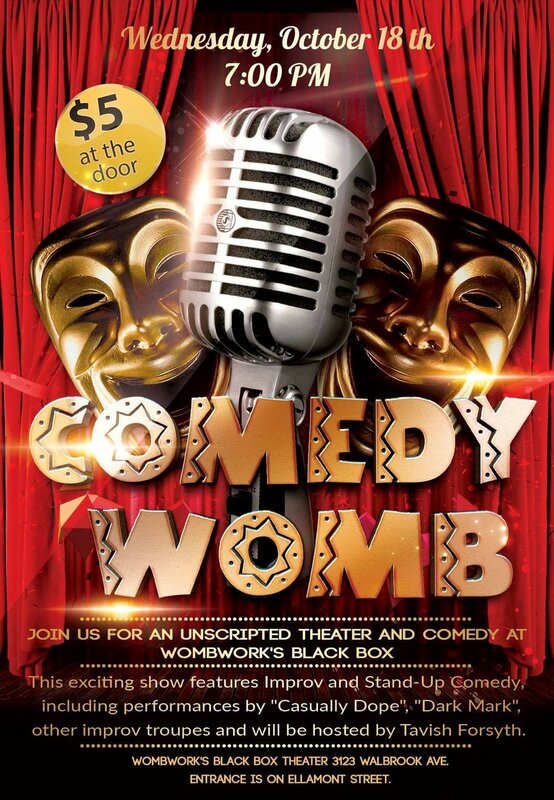 Upcoming Events — WombWork Productions, Inc.
WombWorkers Mama Kay and Mama Ola will be in an Improv Showcase for a class they have been taking at Baltimore Improv Group. Come down and show your support. "Permission- Sexual Assault on College Campuses"
April is Sexual Assault Awareness month. In the wake of the #metoo movement our culture has become much more aware of these types of assaults. Nu World has not been afraid to tackle these topics and invite you to come, watch and discuss how we can stop sexual assault. Permission at Morgan State University Student Center 3rd Floor Friday, April 20th 600 pm. WombWork is participating Light City 2018! We will be in and out in a flashing five minute performance at the Columbus Center, 701 E. Pratt Street. Nu World will be a part the Health Lab @LightCity that explores the health of our society with noted innovators and on-the-ground practitioners whose work and innovative practices have the potential to affect the quality of life and health for people in Baltimore and around the globe. In partnership with Baltimore Leadership School for young women WombWork Productions will be presenting an original production at the historic Lyric featuring our seasoned actors and these young leaders. Come and show your support. WombWork Productions, Inc. will perform at a Kwanzaa Celebration at the Mt. Zion United Methodist Church (3050 Liberty Heights Ave.) from 1pm - 4pm. WombWork Productions, Inc. will perform at Henderson Hopkins Elementary School (2100 Ashland Avenue) for a Kwanzaa Performance. WombWork Productions, Inc. will perform at a Kwanzaa event celebration at the Eubie Blake Cultural Center. More details to follow. WombWork Productions, Inc. will perform at The National Great Blacks in Wax Museum's annual Kwanzaa event. Celebrating the unity of women of faith. Join us for an interactive program. Free Improv Workshop open to all at the WombWork Black Box Theatre (3123 Walbrook Avenue, Baltimore, MD 21216) on Saturday October 21 2pm-4pm. Improv is unscripted comedy. It is about moment-to-moment discovery and flexibility. It’s also extraordinarily fun! In this class students will learn to be confident, creative and collaborative by finding the fullest potential in what is readily available. The truth is everyone improvises every single day, but only a few of us improvise well. Why? We don’t listen to each other. We don’t acknowledge how we feel. We don’t see the merit in others’ ideas. We convince ourselves that what we bring to the table isn’t good enough. Comedy Improv works to curb those bad habits, through its self-empowering philosophy: yes, and. “Yes” is about embracing ideas and the circumstance you are in. “And” is about capitalizing on your situation. No prior experience is necessary to sign-up for this class. You don’t need to be a “funny person.” You don’t need to know any jokes. You just need to be brave, willing to learn, and willing to laugh. Tavish Forsyth is a Baltimore-based actor, writer, and educator. He graduated Stevenson University with a degree in Film, Video & Theatre and has studied performance with the Williamstown Theatre Festival and the Powerhouse Theater. His most recent collaborators include Iron Crow Theatre and the Green Globe Theatre. Through his studies of scripted theatre, Tavish serendipitously found his love of improv. He is a member of both the Charm City Comedy Project and Baltimore Improv Group (BIG). Tavish teaches theatrical and applied improv with Johns Hopkins University and BIG. He likes comedy that is gritty, patient, and honest with a hint of the absurd. Calling Oya: A Movement for Change, is a dance-centric interactive piece where we will explore how we can use the arts to heal from experienced trauma and generational trauma. We are moving towards change and healing. The piece will be followed by a talk back session led by a board certified therapist.